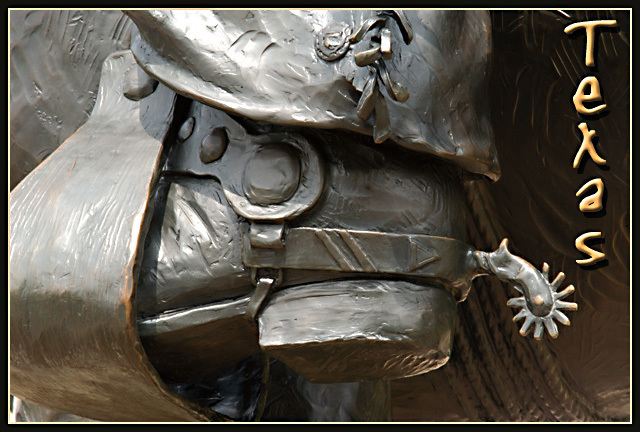 This is a boot and spur on one on the bronze statues in the grouping called "The Crossing". I love this photo...you captured the detail beautifully! and being from Texas myself, makes me appreciate it even more! great eye for this one, and for texas, good work. Nice shot. Good post card subject nice excution. Very postcardy, and technically speaking a beautiful shot. The only thing that kept it at 9 and not 10 for me was a lack of a certain spung, that magic 'Wow!' spark. But I have to save 10s for *something*, right? :-> There's absolutely nothing wrong with this shot that I can find, it just doesn't smack me in the face with the wow factor. Great font choice for this. It really mirrors the texture of the sculpture. Awesome. Outstanding useage of graphics and photo. Color and tone is right on. One of the best in my eyes. An exellent illustration of what Texas is. Nice accompanying text. Is this part of a statue? I love the crop here. It makes me want to see more. Perfect color - 10. I like the font on this, and the picture is very appealing, I find myself coming back to it, so I better up it to a 10! You have captured the essence of the concept of Texas. Your photograph is most excellent - crisp - light - detail - composition. Also, your text font and border are very tasteful. From the thumbnail I thought this was a real cowboy's boot, I almost wish it was, but still I love the idea. The shot is a bit dark near the top right of the frame, but that does give you a more even background to put readable text on so it all works. I liked this because there is strength in its simplicity and you did a great job on the text. It all fits together nicely and portrays Texas to a T.
So nicely done right down to the patina of the metal. This is good! There aren't too many postcards in this challenge with humor. This one is humorous and I like how you have composed it. Nice color, contrast and detail. You got my thumbs up here! Very unique take on this challenge. Exceptional artistically and technically. Lve the lettering! Clever idea, and well executed.Tones are really nice and the font is perfect. This is the winner, and not because I am a Texan. It is beautifully photographed. Nice shot, I love the texture of the boot and spur. And the "Texas" font goes well with the shot. Maybe try putting the logo at the bottom, although it does fill that dark area well. My first 10 and I am more than half way through ;) Original and perfect execution. very nice shot, good detail and lighting, and the choice and execution of the text in the photo was very well done. I really like this. You've abstracted the subject well and it still really communicates Texas. I like the use of the tweaked text here. It's very fitting to this image. Overall well done. would make a great postcard. Proudly hosted by Sargasso Networks. Current Server Time: 04/21/2019 02:05:22 PM EDT.